It was about 10 A.M. That morning the students were stationed in the Gym where they underwent their physical activities. At this point in the morning the proctors came to examine physical aptitude of their students enrolled in CDS Academy. Within the walls of the academy, your reputation meant something and you were immediately identified if you were inside of a faction. You had them lined up from left to right, split into three different groups. "You kids know the initial drill. No magic, only physical abilities and keyblade abilities only and use of fencing and kendo whichever you fancy." 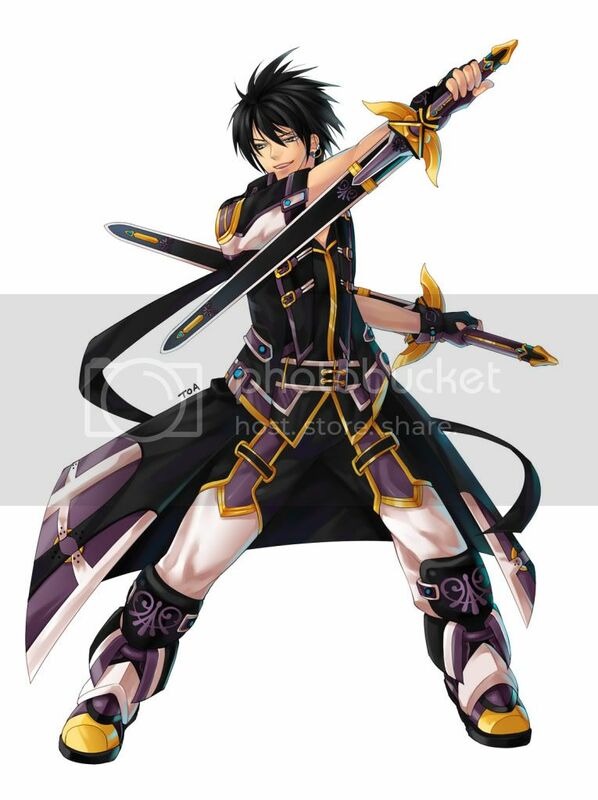 Abilities: Alfa is a well versed fighter, human, but even more versatile than Avalenn and Svether combined. His background consist of a well versed kendo practice making him an amazing two-handed keyblader. Versatility - His movements and interpretive skills combine here. Alfa could easily take on two masters by himself while keeping them both at bay in between his agility, kendo skills, and expert acrobatics. He literally moves all over and supresses the aggression that is focused on himself. An enemy attacking his rear flank would catch his back foot, while the front flank would catch his keyblade. Bide - Alfa can store momentum inside himself through both being hit and collecting the excessive force from the blows and storing them inside of himself. He can also absorb the momentum from enemies upon striking them, sapping a fragments of their HP and converting it inside himself. Upon biding enough stored momentum, it can be released into focused melee attacks, or used as a recovery method to replenish HP. The first option, releasing the bide as an attack, he can one-hit K.O. a normal opponent on the spot, because the transfer is so immense it rends the struck recipient unconscious without any extravagant damage done beyond the first initial hit/shock. Heart Ignition: He refuses to use his because its genuine power is a manifold and can literally kill who he hits with it. Ability- Jet-Engine Hybrid: His keyblade releases a periwinkle colored flame which is used as a propulsion system during battles. It expells from the very back, where the chain runs from the keychain. Both for evasive as well as offensive maneuverability. Ability- Ignition: Sensory ability, that allows the interpretation in slow motion, both enemies and magic in flow. When holding this keyblade, the eyes of the user avert to lime green, and the anticipate the motions and subtle reactions of enemies in tow, ignition primarily means 'epiphany' by the understanding of the wielder. When Alfa activates, he fights in combination with his other abilities and dominates like a complete monster. The ironic part didn't even occur yet. A fairly short male stood up and stretched, as his blue shorts and white beater tee where stretching as he pulled himself together. A spry spring in his step he hopped up and down and waited for someone to approach the floor. His eyes were up and he did a quick pan of the people, naturally all three factions were to their own groups, and the normal students seemed to shake and looked uncertain as the quickly identified a member of Zeal's Call. Several footsteps, backward from that side of the gym, the sound of Reforge's obnoxious laughing could be heard from the bleachers. Appearance: Chizuma stands at five feet six inches tall. She has long green hair that falls all the way down to her knees. Her hair is bound together at the end by a magenta spherical barrette, with a few inches left hanging out and curved upwards. Her skin is rather pale, something that even hours of basking in the sun won't change. She might just look sickly if not for her obvious energy. She has large round eyes colored with a dark purple hue. She has a small smooth nose and a large mouth, which more often than not shows off her pearly white teeth. Her face is overall round, and one you could say is attractive.... If you can get past the creepy smile. As for her body build Chizuma is built like a ballerina, with curves that are subtle yet eye catching. Her chest is fairly modest, nothing to really mention. As for her clothing she tends to wear tight, near blood clotting clothes. The color scheme for said clothes is ALWAYS green, no exceptions. More often than not her midriff is exposed, a fashion statement she seemed to take to heart. She has a green utility belt around her waist, which carries many of her devices. Flexibility - Chizuma's lithe body isn't just for show. He limbs are highly flexible, and her muscles have been trained to endure long sprints of action with little need for rest. She can easily evade direct attacks by bending in nearly impossible ways, and under dire circumstances can dislodge her joins for further utility. Agility - Chizuma is a speedster on the battlefield, however she doesn't use this speed like most do. She's always moving, creating as much chaos as possible and more often than not dealing damage through indirect means. She utilizes various devices to disorient and trap her opponent, from smoke bombs to wire traps, one can never guess what she'll pull out next. Chizuma also has cat like reflexes, and it able to react quickly to incoming threats. Keyblade: Verdant Swirl. This keyblade is one designed to be held and used in an arbitrary manner. It is four and a half feet long. The shaft is as thin as a golf club's, and the blade is thinly serrated on the tip, extending for four inches to just barely give it the appearance of a proper 'key' The handle of the blade is covered with a convex guard, hiding Chizuma's hand from sight as she wields it. The Verdant Swirl lives up to it's name, as it is covered in a pattern of swirling greens that give it a surreal mysticism. This color scheme ties in with the blade's ability. While in combat, Chizuma can spin her keyblade to create an illusion. Her body will fade into a swirl of blurry green, and as she speeds up she will leave a trail of green that leaves her real position vague at best. from this cover she can gain the advantage over aggressive opponents, and counter with hard to follow blows. Personality: You'll be hard pressed to see Chizuma without her signature wide grin on her face. No matter the situation, no matter the mood of the room, she will not break her slasher grin. She has an attitude to match this smile, as she never takes anything seriously. Chizuma tends to laugh things off, and jokes around regardless of what's going on. She can't stand dreary moods, and will do whatever she can to brighten things up. Naturally this gets her in a lot of trouble, though that only seems to make her want to misbehave even more. Chizuma enjoys having friends, however she also enjoys messing with people to see how they react. She often plays tricks on her friends, which she does not apologize for. She just wants to lighten things up, as she thinks people are far too uptight and take the great things they have for granted. "Oh, oh! I'm up!" Chizuma sprang upwards from her seat, leaping onto the floor like a giddy actress about to go on stage to an adoring audience. She tugged at her 30 pound utility belt, and shot a smile towards Alfa. "Yo Falalfle! Let's do this!" She summoned her keyblade to her left hand, twirling it once to get the familiar feeling of battle coursing through her. Her other free hand reached into her belt, and from it she produced a green sphere. "You should be familiar with this one, let's start off nice and easy!" She threw the green ball at Alfa's feet, and as soon as it hit something solid it exploded, releasing a cloud of thick green smoke. Chizuma rushed in, leaping upwards and sending an axe kick towards Alfa's head. There was a buzz already brewing, the member of zeals call took his position. Both of his hands were empty, he'd call either verision of his keyblade at the appropriate time. When she approached the banter had ensued, he spotted the ball, but wasn't immediately familiar with it. Where he'd normally scratch his head, as it was tossed immediately he was smoked out. He held his breathe for a moment, that seemed to be all the time she needed, too little too late did he see it coming. Pelted with a direct kick, he tried to avert some of the momentum tilting back to surf the same direction as the kick. Plummeting over he spun outside of the green cloud of smoke titillating against the ground, and catching himself into a skid as he rubbed his face with one hand and reeled the free hand back as he crouched. "Stri-"
"You know the rules, no magic. Relying on strike raid is the same as using it. Warning one." He switched keychains this time, the appearance of the keyblade briefly shifted and rapidly tapped the surface of the gym floor quickly biding from the stationary surface into his keyblade. He swung his keyblade on a vertical swipe kick up an updraft as he released the bide into the air, carrying the power of an industrial fan. Easily blowing away the lingering smoke while sending a breeze to that side of the gym that subsided within seconds. He slung his terkoiz over his shoulder and stood completely stationary, "Well come on, we don't have all period. Lets do this." Chizuma stuck her tongue out at Alfa with child like glee as he made a sarcastic remark about her. "I've never been on crusades, and capes get snagged too easily thank you very much." She giggled, her giddy attitude not faltering even in the midst of a duel. Her violet eyes sparkled as she saw Alfa's signature green pedals dance in the air around him. She fawned over the sight, pointing and blurting out. "Oh, there it is! You have just gotta show me how to do that Falsetto!" She said, bouncing up and down on her toes like a caffeine addict. Yes, she had an affinity for the color green, if that was not already apparent enough. She tilted her head slightly as Alfa switched out his keychain. Chizuma pouted as much as her deranged face could take, forever holding a hint of envy towards those that possessed more than one keychain. Alfa swept up a strong current of air, blowing away her smoke in the process. Chizuma stepped sideways from the wind, and held up her keyblade to diverge the air away from her so as to prevent it from upsetting her balance. An attack was half-expected, but one did not come, instead it appeared that her opponent wished for her to take the initiative once again. She was no fool, she knew what those dazzling pedals really meant, using his ability he had buffered the damage from her kick in some way. He wanted her to attack, she just knew it. She laughed at his taunt, and began spinning her keyblade in front of her like a mossy windmill. "Well alrighty then~"
The spinning increased in speed until her body became nothing more than a green smear in his vision. She charged forward, causing the smear to increase in size as it closed in on him, just as she entered the range of his blade she back-stepped. Physically, she was out of his range, however, to him it would appear as if she were just about to charge in for a blow. This was true in a way, however the timing and placement would be deceptive. The trail of her green blur remained the same size, and as her heel hit the ground from stepping back, she flipped to Alfa's offhand side, where it would take just a bit longer for him to defend himself with his keyblade. In mid-flip her free hand planted upon the floor, and she used her swirling momentum to swing the blunt end of her keyblade towards Alfa's side. Her hand pushed off the ground, and she flipped backwards behind him so as to gain distance from him. "Theres the fire." he muttered extending his arm as he held his Terkoiz firmly, 'Ignition.' Readied against him with what he could only discern as a moving vortex, it was no different than a top. Crouching down as she started moving, he placed his keyblade on the floor, his hand was still on the grip. When she stepped back, and came around his eyes darted to the other flank. "Switch hands." The keyblade jumped to his left hand and he released a jab while his ignition slow it down for him enough to prod right through the guard and grip of her hand. This effectively stopped all motion briefly, "Switch, FL." He uttered, twisting his hand holding the steel between her grip and a periwinkle flame boosted them both upward. His legs clutched her waist when he shot up at least three feet off the ground, upon getting half way up he dismissed his FL, and he reeled his legs back, pulling on her shirt to jump around and behind her. His foot planting into her back, as he used her body as a foot stool to demonstrate his strategic maneuver. She'd merely fall at slightly faster pull of gravity. Alfa caught a hold of one of the gym's dangling lights and swung back and forth tilting in place. "You really got the drop on me." he said attempting to be witty, before he dropped down from the suspended lamp, tucking into a backflip. His acrobatics were proficient enough that both of his knees cracked as he landed. His blue shorts and white shirt hadn't seen much action, fairly clean still. Patches of sweat beneath his shirt were seen however, the taunting that Erebos offered only seemed to continue. "Maybe actually try fighting FLLFFL." Again, his frontal lobe throbbed. "Yeah, well if thats what we're supposed to do ok." he said still rubbing his cheek. Pulling his hand back he slowly began to walk toward Chizuma. "On your feet, this is your first lesson in kendo." the particles of light that formed his keyblade formed ever so slowly. His terkoiz again, it always felt safer to have in a 1v1 situation, and he gripped it with both hands this time, something he hadn't done earlier. Taking a step, there was a creek in the floor, "Lets go!" he took off into an adequately paced dash closing the distance between himself and Chizuma, as he approached from above with a diagonal swing reeled forward. Chizuma's eyes shook with startled realization as she felt Alfa stop her attack's momentum. She tried to flip away, but it was too late. Alfa caught her, ensnaring her and boosting her upwards. The grip on her keyblade was let go, and as it dropped to the floor she pounded on him with her hands, though she was in no position for the blows to do much damage. She gasped as he pulled on her shirt, it was already tight enough, any more and he'd have likely ripped it right off of her. She was tempted to make a quip about him skipping to second base, but the foot in her back convinced her otherwise. As she was falling towards the wooden floor, she tucked her body into a ball, rolling as she landed like a green hedgehog. Sprouting to her feet like a dandelion she looked up at Alfa as he swung from a light fixture. He made a terrible pun, one which caused Chizuma to laugh like a manic. "Wow Flounder, that's a good one." She said. Walking over to her keyblade she picked it up, tightening her grip on it as Alfa walked towards her. She spun her keyblade a few times, seeming to be focused on something on the ground. Meanwhile Alfa yelled "Let's go!" and charged towards her. Chizuma did not charge forward to meet him, instead she began to rapidly spin her keyblade at her side. As he closed in on her, her smile turned eerie for a moment. "Gotcha!" She yanked her keyblade back, and a thin wire was tugged. This thread was attached to the handle of her keyblade, with the other end threaded into Alfa's right sleeve. When she had been pounding him in the air, she had actually been threading a fine wire through his clothing. She had been spinning her keyblade to quickly gather up the loose wire, waiting for the right moment to strike. Alfa's swing came down, however Chizuma had redirected it via the wire, (which was quickly snipped and rendered useless, she didn't want him using it against her after all.) even if it was a little, it was enough for her to slip past his attack and catch him off guard. "Didn't you..." She sent a sweep kick at his legs, intending to knock him down. "Find it odd that..." She flipped to her hands, in a movement that resembled the dance like fighting style capoeira, she swung both of her feet into his chest. "I picked my blade up, instead of recalling it?" She snickered, pushing off of the ground and flipping in mid air. She gripped her keyblade with both hands, and brought the blunt edge down towards his head. The timing was down to the wire, it was a little late again catching wind of the thread. He began biding, as the attacks came in, this would do fine, just a little. "I think all non-keyblade attacks should be banned." he said as calling his FL to hover just over his head, the valve pointed toward Chizuma as she came down. It spit flame in burst, just fast enough to change the course/stop her from finishing the swing (not enough to burn, but enough to drop and hold your hand). As Alfa fell back, the floorboard made the most obnoxious sound, it creaked. 'Loose?' he thought. Looking at where she was, it gave him a brief idea. His fist that bided the friction of where his body absorbed damage, slamming into the loose wooden plank. This would've effectively launched her in an arc just above him, and he reeled back throwing his FL in a straight line upward with its jet engine spearing just past her abdomen (a direct impact would've been too much since he threw it using bide). His head felt dizzy, and he stumbled back. Rubbing his cheek again, he held his arms out to apprehend the falling body which just made him fall again, crushed under her weight, unconscious. "Well would you look at that, I think you killed him." the teacher said laughing. "Whoa!" Chizuma screamed as a wooden plank came loose, it slammed into her, not hurting her very much, but sending her up in the air in an arc. Her eyes had closed shut in stimuli to being hit, and right as she opened them she saw Alfa's keyblade soaring towards her. Before she even had time to scream once again about it the blade blasted past her, only grazing her side. It was all well and good that Alfa had missed her, however she was still falling towards him. He did something odd, choosing not to attack her, but to reach out and attempt to grab her. Instead of being grabbed, she slammed into him like a renegade crash test dummy. Opening her eyes, she felt Alfa's chest in her hands, she was on top of him. She blinked a few times, as her head was spinning like the tail end of a rattlesnake. "Eh? Alfa?" She looked down at his face, and was surprised to see that he was not moving. "Well would you look at that, I think you killed him." She heard her sensei say. "WHAT!" Chizuma screamed, her signature smile collapsing into a sorrowful frown. She grabbed Alfa by his shoulders, lifting him upwards. "No no no no! Alfa you can't die!" She shook him violently, causing his head to bounce back and forth like a bobblehead. "I'm sorry! I-I won't use anymore tricks, I'll fight with you fair and square I promise!" Tears started to stream out of her eyes at an alarming rate. She let Alfa's shoulders go, letting his head hit the floorboards. "Whaaa!" She cried, tears falling from her face and staining his shirt. "You can't die Alfa! I-I... I love you!" The violent shaking was enough to ressurrect any man from the dead, Alfa pulled his head up, breaking his ragdoll expression from being shaken. His hand was still shaking, the blood condensed in his fist that gave him goose bumps practically felt a little numb now. He'd taken out his right hand biding all that potential energy and releasing it, easy to say the muscle along his right arm were spent. The red sting of his cheek and how awkward it was already to even fight a woman was, well odd. "No thanks sugar, if you noticed my right arm is a darker color than the left one. Essentially that means it's dead, I wouldn't be able to use it for the remainder of the day with all the work I put on it just now. Teach lets call it a day, pretty sure i busted my arm and can't continue." "Fair enough. That completes the exercise." The member of Zeal's Call rose gradually, and his right arm slumped over completely neutralized, he was serious about being unable to continue lest he risk doing permanent damage to his body. Had he the intent to actually maim his classmate, his family would be charged and he'd gain a record as "a vagrant" that he couldn't weigh on his conscience along side brutalizing another person. The chest wound he inflicted, like his arm would heal up in about a day or so. Alfa thought about all of these things as realistically as possible, the fact alone he had to dispense against a woman was some feminist entrapment. He sighed, giving Reforge a rather miserable look as he approached the bleachers and exiting the court as used his free arm to raise his limp one. "Think you could fix me up. Sorry for making us look bad out there, melee against traps was pretty hard to outwit." Their second in command yawned, and gave reforge his arm to cast a curative spell over, preferably one with painkillers to reduce the twinging of both his face and right arm.